LUCY BURDETTE: Don't you love it when one of your "I will buy anything she writes" authors has a new release? I sure do! Maddie Dawson is one of mine--and I persuaded her to visit JRW today. Welcome Maddie!! I had none of those skills, particularly the one about marrying men with money. And when I had been married to my first husband for nearly ten years, I discovered that I wasn’t good at marrying men who wanted to be faithful either. My husband had fallen in love with someone else, a woman who declared that she was a witch. Magic, huh? So I went to the library and found a book called Positive Magic by Marion Weinstein. I learned about the Law of Attraction and the Law of Allowing, and pretty soon I was able to change stoplights to green, get perfect parking spaces—and after a while, in what was the biggest magic of all, I realized I didn’t want my husband back after all. Six years later, a psychic told me that my life was just about to undergo a magical transformation—and on the same day, I had my first date with the man who became my second husband. We raised three kids, bought a house, took vacations in France. I started writing novels in earnest—which was what I’d always wanted to do. And then, six novels in, years after my mother had passed away, I decided I wanted to write a novel that had some magic to it. This felt a little crazy, and I was embarrassed to tell my friends what I was working on. What if it was…stupid? Or what if I couldn’t tell it right? Who was I to write about magic when all I’d ever done was manifest a new husband I adored as well as some pretty good parking spots and green lights? But if there is one thing I’ve learned over the years about writing novels, it’s this: when you put the intention out there in the world to write a certain novel, characters show up and start telling you the story. And if you’re smart, you don’t dare turn them away. And sure enough, somebody named Blix came thundering into my inner life, a fictional eighty-five year old spitfire who lived in a Brooklyn brownstone and was full of kindness and love (as well as vim and vinegar) and who just happened to be dying of a cancerous tumor she had named Cassandra. She also had a book of spells and a lover named Houndy, and she loved nothing more than matchmaking and seeing where everybody needed to be in order to be happy. She wasn’t scared of dying, but she knew that her time was running out—so she wanted to find a successor to continue her work, and she just happened to have somebody in mind for the job, her grandnephew’s ex-wife. But then—well, after a few months, I felt something shift in me. Blix was bold, and I decided to be bold, too. I started expecting the story to unfold before me instead of worrying that it wouldn’t. I threw out the outline I had made, and I started to trust the process to lead the way. It was scary. So scary! I had a deadline, after all. And I didn’t know where I was going. One of the magic principles my mother used to talk about the most was the Law of Relinquishment. She said that sometimes when you give up on something—really, really give up on it, no faking—it starts to work out. And Blix seemed to be telling me that that might be the best way to write this book, too. As a piece of writing advice, it might seem a bit insane—but I really think it’s the best thing you can do with some books (and maybe some life situations, too): GIVE UP. Relinquish the need to control the outcome. Throw out your plan, and see what comes from the unseen world. Let the character tell YOU the story. And above all, if your character wakes you up in the middle of the night and wants to tell you about the guy who lives in her basement, get up and write it down. This, I learned, is where the story magic happens—when you’re willing to listen hard and feel your way to telling it the right way. Maddie Dawson is the author of seven novels, including her latest, Matchmaking for Beginners, which is a Washington Post and Amazon bestseller. 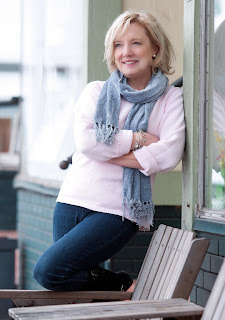 She lives in Guilford, Connecticut, where she teaches writing workshops and writes novels on her screened porch next to a nest of robins whom she has been known to talk to. She probably needs to get out more. Congratulations on your newest book, Maddie . 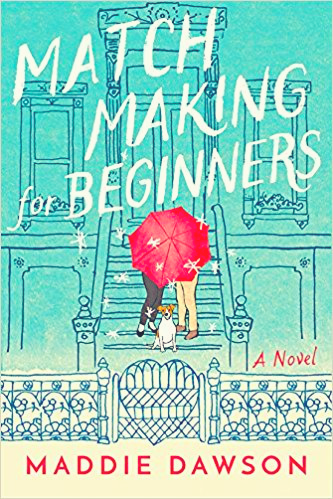 . . “Matchmaking for Beginners” sounds delightful and I’m looking forward to meeting Blix and checking out that special story magic . . . .
Hi, Joan! Thank you so much! I hope you enjoy it. What a wonderful-sounding book! And if Roberta says she'll read anything by an author, I'm totally game for the adventure. I do believe you can manifest things into your life, although no rich husbands on this front. I have wound up with a great car and the perfect house, however, by holding the vision in my heart and not giving up. Plus, some very interesting people have wandered into my life soon after I wrote about people very much like them. Perhaps I need to write about that very rich husband? Hi, Gigi! Roberta is the best, isn't she? I loved your story about manifesting the great car and the perfect house--those are amazing! (And did I somehow imply that the husband was rich? That would be not quite true...) I do think it's true that holding the vision and not giving up are truly the keys to finding what we want and need. I love to hear that from somebody else, too. My friends mostly think I'm wacky when i say stuff like that. I can see them roll their eyes! Nope. No eye-rolling here. Perhaps you need to hang out with more wiccans and pagans? I think lots of magical things happen every day, except usually it's the subtle magic that fills in little moments of delight, only if you bother to pay attention. Also, if you envisioned selling many new copies of your book after coming on to Jungle Red Writers, you should know that my copy is on its way. The book sounds fabulous, Maddie! (One of the names I write under is Maddie Day, so I feel like we're twinsies or something.) I agree completely about letting the characters tell you the story, and I've always described it as magic when someone or something shows up in the story that I hadn't planned for and am surprised by. I'm off to order your book. Holly is a dear and almost a neighbor! Who says you need to get out more? I say, stay home on your screened porch and write more! (Unless it's winter and then maybe you want to move inside). Now I gotta get going--there's a feisty 85-year old calling my name--she wants me to read her story--who knows where it will take me??!! Wheeee!!!! Flora! Is BLIX over at your house, calling your name? I've been looking for that rascal. Am thinking of trying to do a sequel, and I'd love it if she'd come over here and sprinkle some of her wisdom on me. If you see her, send her back over! <3 And thank you for reading! Hope you like the book. Oh yes, this could lead to a wonderful sequel! Thank you! I think so too. Surely these characters will come back and start waking me up in the night again with their love and trouble. I've had your book for a month now tempting me from my very large to-read-pile... I'm definitely moving it to the top and can't wait to dive in and meet Blix! Congratulations on your new release! Thank you, Kim! I know all about that large to-read pile. And also the large to-write pile. Seems they are always at war with each other, aren't they? Glad to know that Matchmaking is in good company over there, though. Hope you like it! Loved this post! Whether belief in magic is literal or metaphorical,it is an interesting way to think about life's twists and turns, and about writing too. The book sounds like so much fun. Going to order it today. Thank you, Triss. I agree with you about it being interesting, whether we see magic as literal or metaphorical. In a workshop once, I gave an assignment to write about "things you believe in--like signs--that no one else does," and I got such fascinating responses. Seems there are a lot of us out there! So glad to have you here, Maddie! Matchmaking and magic! Love the combination. Though I confess when I finally write THE END, what I say to my characters is more long the lines of "thank G-d that's over" rather than "thank you." Ha! Hallie, I know exactly what you mean. These characters did NOT make the story easy for me. I frankly said, "Thank you, and get out of here and take your stubbornness with you!" Now I think of them fondly...it's like children going off to college. Maddie, the level with which I agree to you is incalculable ! I try to explain it all the time, and you do it so beautifully, but being present in the universe, and putting your intention out there is the most powerful thing. It Defies understanding, but it is the most remarkable power . It almost brings tears to my eyes to talk about it. I cannot wait to start reading! Very interesting, Maddie! Just now reading about RELINQUISHING I realized that maybe that's what I should do about a situation I have. I'm already sorta halfway there. I will very seriously consider your idea! Thank you. A little magic never hurts! Hi, Judi! It's a funny thing about relinquishing, isn't it? I believe that it really does work, but I also believe you have to REALLY relinquish. You can't do it if what you're intending is to still hope for what you want to happen. Not trying to control things is the hardest thing for me. I always think I have to be in charge of everything. Was it Anne Lamott who says she sees herself as God's west-coast representative? Always makes me laugh. Because I may be the east-coast rep. (I try to help out where I can.) Good luck with your situation. I'm rooting for you. Maddie, your mother was a wise woman, in all senses of the word. Aren't you lucky to have had her amazing example? I've seen these laws work in my own life, so many times. And have had characters who completely took over, too, although not enough to make a story go past the mushy middle. Who's to say we know everything, right? Blix sounds like my kind of gal. Thank you for bringing her to life! Ha ha! I love that...the "mushy middle." And man, they DO get mushy, don't they? I was sloshing around in the mush with this one for a long, long time. Fantasizing about becoming, I don't know, a dental assistant or something. A party planner! Somebody who operates the jackhammer in the street! ANYTHING but listening to imaginary friends all day long as they led me through page after page of mush. But then--I don't know what happened--I gave up and things started to straighten out. The story came forth. (I will admit I did have to put these characters on notice.) So don't give up. The middle can unmush itself. Magic sounds a lot like basic life wisdom, Maddie! Finding parking places through magic reminds me too of an old nun who was the cook at one of my schools. She would say endless novenas for certain outcomes - especially to Saint Anthony to find lost things. These might include things like her favorite wooden cooking spoon which she would find shortly afterwards on the window sill where she’d left it. Saintly intervention, magic? Perhaps. Fun post and Match-Making sounds like a great read! Marian, I love this story! Maybe it doesn't matter how you ask for things--through novenas, lists, prayers, directions, threats, promises. Maybe it's all just a matter of intention and then having faith in the outcome enough to let go. I guess we will never really know how it all works, but in the meantime it's a fun way to think of the world. Maddie, MATCHMAKING FOR BEGINNERS sounds delightful! I have read several amazing and wonderful books with magic in them, even though if you asked me out of the blue, I'd probably say that wasn't a type that interested me. (Hmm, need to work on knowing myself a bit better, I see!) I particularly like the concept that this feisty, exuberant woman isn't afraid of dying but desperately wants to find someone to carry on her work. Will definitely add this one to the TBR list. Thank you, Susan. I'm with you about reading about magic. I don't usually think of myself as someone who reads supernatural or fantasy novels. And I really didn't want to be writing one. I struggled with how to get the magic part across, and decided that the lightest of touches would suit me best. So although Blix does think of herself as magic and a matchmaking genius, enough goes wrong with her spells and her intentions that we don't ever see her as infallible, I think. Wise maybe, but also very human in crossing things up. Maddie, welcome to Jungle Reds! I saw a photo of your book by a bookstagrammer on Instagram yesterday. Loved the cover. Now that I know more about your book, I want to read your book. I love magic. Thank you, Diana! I hope you like it. The cover really IS extraordinary, isn't it? I could not have asked for a better cover. Love that color--and the red umbrella! Congrats on the book, Maddie! I love that magic when the characters take over and tell you where to go with the story. Thank you, Mary/Liz. Sometimes if the characters didn't tell me where the story was going there wouldn't be a story. They seem to know so much more than I do. They're just often stubborn about revealing it, LOL! So happy to have you here Maddie/Sandi! I meant to tell everyone else that this book is a wonderful respite from all the grim stories in the news these days. That's one reason I loved it. Do you mind telling us a little about publishing with Amazon--how that has been different in good and less good ways? I know that the power of their advertising and marketing is astonishing. And that they delivered a gorgeous book...anything else? Thank you, Lucy/Roberta. (My, there are a lot of us who have two identities, aren't there?) I love talking about my experience publishing with Amazon because I was one of those authors who thought it was perhaps not such a good idea. Amazon has certainly upended the world of publishing, and I love indie bookstores a LOT. But having not many options open to me at the time with my fifth novel, I decided to do it, with my agent's advice. And now I have to say that I have found them to be delightful--and way more attentive to authors than any of my previous publishers. I was previously published by St. Martin's Press, then Shaye Areheart (an imprint of Crown/Random House) and also by a small press. What I love (and was surprised about) is that Amazon pays incredible attention to detail. They hire artists to design the covers (whereas Crown simply used stock art on two of my books, which little did I know had been used on previous books--arrgh!) They also hire developmental editors who spend time going over the novel and work alongside the author for weeks going over everything. And who doesn't need that? By the time I finished the edits, I felt that the editor knew the book as well as I did, and had just as much of an emotional connection to making sure it was told right. I've never felt with them, the way I often felt with other publishers, that I was simply a mid-list author whose work was routine to them. I was incredibly lucky that Matchmaking for Beginners was named an Amazon First Reads book, which means that it was released a month early for certain Kindle readers who could choose it from one of five books and read it for free--or people could order it at a reduced rate in hardcover a whole month early. I don't know the mechanism of how or why my book got selected for this magical miracle (maybe Blix?) but because of that, I've gotten scads more readers than I ever could have reached with my own efforts. Like, hundreds more. Other authors I know who have been chosen for this program report the same thing happened to them. Because I had so many more readers available to me, the book became a Washington Post bestseller and an Amazon Charts bestseller before it even was officially published. Unheard of, in my little corner of the publishing world, where it often felt I had to beg friends and family to buy my book. That Amazon algorithm knows just who is interested in buying our books--and puts the book front and center right in their in-box. The downside? And yes, there is one. Bookstores! If you love going into a bookstore and seeing your book shining out from the shelves, you might not have that experience with Amazon. Although stores can certainly order the book, and they receive terms competitive with other books they buy from more traditional publisher, some of them don't want to do it just because it's Amazon, which I understand and sympathize with. (I'm too scared to ask my local bookstores, LOL!) Frankly, though, with my books--I often didn't see my books in stores after the first couple of weeks. Hardly anyone re-ordered when the original copies sold, and I always had a kind of PTSD reaction when I'd go to a bookstore looking to see if my book was there. Because so often it was not. So--there you have it! I'm glad I went with Amazon. I have friends who say they would NEVER do it, and both things feel right to me. In my case, I feel like I got a new second chance with my writing career and was allowed to write books I'm proud of, and in the process, I reached readers who enjoyed the book...and that's what I'm here for. This voice! Yes, I will read anything you write!! Can't wait. I believe in magic, and getting help from "out there." I had a friend, Marguerite, who would say a Hail Mary when she needed a parking space. She died a few years ago, and I have inherited her power. And as I park, I say, "Thanks, Marguerite." Wow! Thank you, Denise Ann! I love that--"Thanks, Marguerite!" for parking spots. I can get parking spots, too, unless I'm thinking about it too hard and wondering if it's going to happen. This is a great story! Blix sounds like a wonderful character, Maddie! We all need a Blix in our lives. Do you remember how you came up with her unique name? I appreciate your words about relinquishing things to the universe. For the control enthusiasts among us, it's a lesson that bears repeating. It's so hard to do, but so liberating! I'm trying to remember just how I came up with Blix's name. One of my favorite parts is naming characters...and I often change their names again and again as they evolve in the writing of the book. But Blix just sort of showed up, told me her name, and that was that. It never changed once. As with so many things about that character, I felt like the information just fell intact into my brain and I didn't have to question it. I hope she'll come by and help me with a new book now! Hi Maddie! I already have your book in my Kindle queue, because I thought it looked delightful--and now I'm even more looking forward to reading it. I've described what happens in the process of writing books as magic, too--that moment your characters start talking to each other without your intervention-- but I'd like to think that magic extends to real life as well. We could certainly use more of it! I, too, love that moment when the characters start talking to each other without my consent. There's a book by Ursula Hegi, I believe, about a writer whose characters start arguing with her. She's doing the grocery shopping in one scene, and one of the male protagonists shows up in the grocery cart and starts telling her he would NEVER do what she just wrote that he did. And she's shopping along and arguing with him. Sometimes it feels just that way, doesn't it? And that IS the most astonishing thing about writing characters, I find--the way that even though (let's face it) we did create them and they are simply words on a page, we cannot force them into anything they don't want to do. The writing becomes stilted and false and doesn't ring true anymore. We have to let them tell the story. Sigh! In their own way. (Another sigh!) Good luck with the "mushy" middle. That is now officially my favorite phrase. Maddie, you may not realize it, but you just gave some of the best parenting advice ever. "Relinquish the need to control the outcome. Throw out your plan, and see what comes from the unseen world. Let the character tell YOU the story." Of course, you did say that this applies to life as well as writing. My son, who will be 31 in three days, is a brilliant, creative person who has in the past year gotten his life streaming the way he wants. The "he wants" is key here. His father's suggestions and a few of mine weren't what he needed. He is working on a book while holding a job where he is respected, although it doesn't pay great, and is finally valuing himself for his creative talents. And, it was like magic indeed did take over when I quit trying to control his (the character's) outcome, as well as convincing his dad to stop. We all get to where we're going by different paths and learning to accept that is important to reducing the stress. So, you might want to write a parenting guide next. Hahaha! I do love the idea of magic working in our lives, and I so need to learn to relax more and let the magic work. I'm looking forward to reading this new book of yours, Maddie. Blix is sure to be a character I won't forget. This post was just what I needed to read today! I am charmed, dazzled, and beguiled by it, Maddie. Seriously, I think it's my fave post on JRW of all time. Thanks so much for visiting today and for following Blix wherever she led you. I'd stay and chat some more, but I'm off to buy your book now. I can't wait to read it!